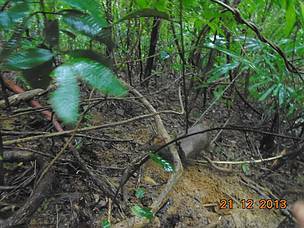 On the 21th of December, a Truong Son Muntjac (Muntiacus truongsonensis), a rare species of the Central Annamite, was saved from a trap by a team of forest guards in Thua Thien Hue Saola Nature Reserve. Though it was very worrying to see a muntjac in a trap set by local people, it brought great joy and happiness to the team as for more than 10 years, no observation of an alive muntjac in its natural habitat was made in Vietnam. This incident was a great reward for the tireless efforts of the forest guard team, a joint operation between WWF Vietnam through the Carbon Sinks and Biodiverisity programme (CarBi), and the Hue Saola NR, who are patrolling 22 days a month to keep the area free of threats to wildlife. To learn more about the work of the forest guards and the challenges they are facing in everyday work, we have an interview with Mr. Luong Viet Hung, Protected Area Manager, CarBi Programme, WWF-Vietnam, who is closely collaborating with the Hue Saola Nature Reserve (NR) Management Board to manage the forest guard patrol teams in Hue Saola NR. How did you feel when seeing the video and images of the animal alive? 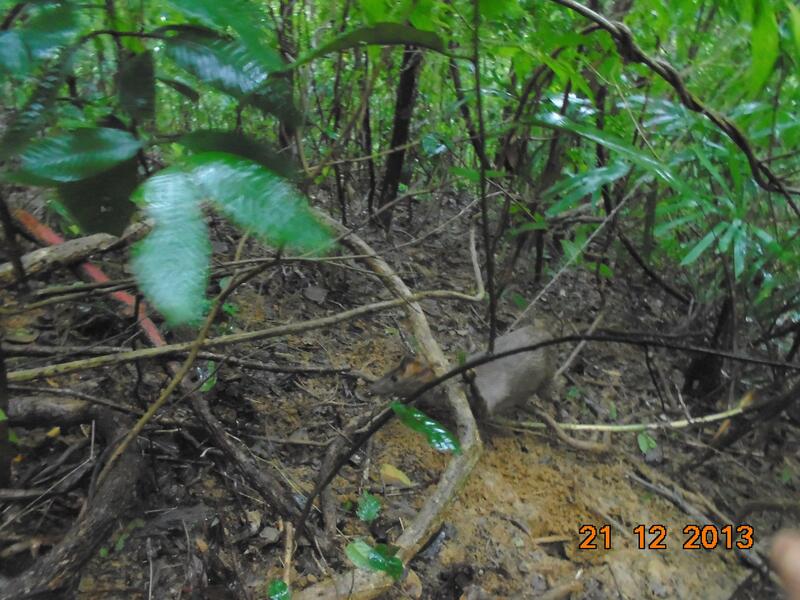 When I received the short video clips and images of Muntjac species trapped from Mr. Bui Huu Vinh, the forest guard team leader with the brief description: “Our team are patrolling in forest patrolling block within Hue Saola Nature reserve. We saw new tracks of hunter along trail. We checked carefully around areas and had removed more than 10 snares. Suddenly, we hear the voice, and with my experience of nearly 3 years, I was sure that was the screeming of an animal which was trapped. We ran towards the direction of the screeming voice, which became louder and louder. Finally we saw a trapped animal. 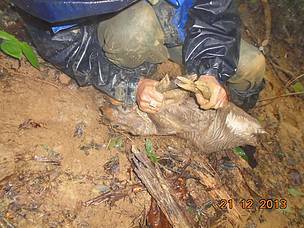 We destroyed the traps and the Muntjac was released into forest”. I thought it was a rare and endangered Muntjac but we did not know exactly what kind of muntjac specifically. We were very happy because we gave one more life opportunity for an animal regardless whether it was a rare species or not. 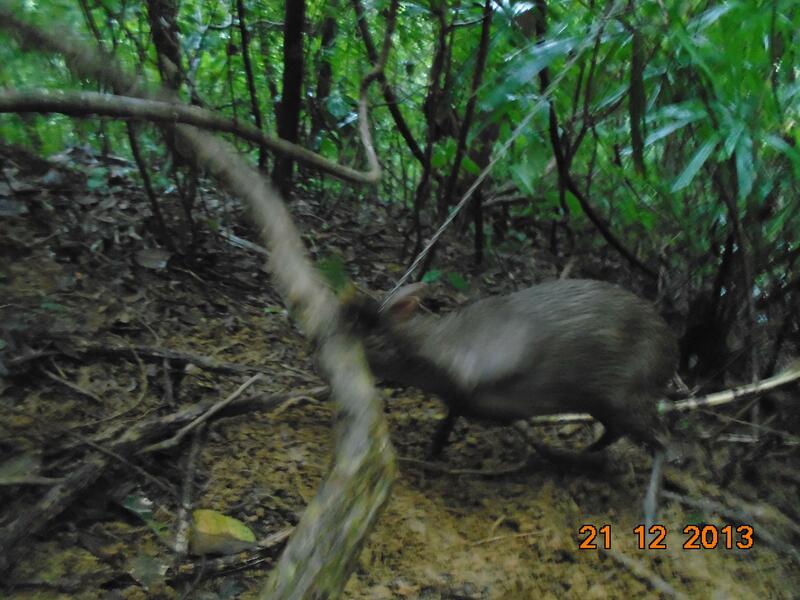 We felt more happy when advised by WWF experts that we saved the Truong Son Muntjac, an endangered endemic species. What is the biodiversity value of this Muntjac and how is the discovery important to conservation? The Central Annamites landscape in Vietnam and Laos in general, and Hue Saola landscape in specific, are of global importance to conservation. Three endemic ungulated species, including Saola (Pseudoryx nghetinhensis), large-antlered muntjac (Megamuntiacus vuquangensis) and Truong Son muntjac (Muntiacus truongsonensis) were first uncovered to science in the 1990s in the Annamites. CarBi Programme has recently also recorded Large-antlered muntjac by camera trap, and now we recorded one more rare endemic ungulated species, the Truong Son muntjac after 10 years of searching. So two of the three endemic ungulates present in Hue Saola NR. The recent re-discovery of Saola in the Quang Nam Nature Reserve, also by WWF Vietnam’s CarBi Programme, makes us confident that we will also find this unique species in the Hue Saola Nature Reserve. What are the main threats to the Muntjac and wildlife in the Annamites? The greatest threat to Truong Son Muntjac populations is the high levels of uncontrolled hunting. While not usually targeted by hunters, Truong Son Muntjac can become the incidental by-catch of hunting techniques targeted at more ‘common’ species, sought for the illegal commercial wildlife trade such as wild pig, serow, bear, sambar, deer, monkey, etc. Truong Son Muntjac and other wildlife are facing the potential risk of extinction in the near future if there is not going to be a focused effort to intensify effective protection methods. What is WWF doing to secure a safe environment for the wildlife in the area? WWF has a lot of efforts and coordinating with government partners to develop short and long term strategies to protect wildlife, especially focusing on the specific forest areas with potentially the highest numbers of wildlife. The Forest Guard Model, carried out by WWF-Vietnam through the CarBi programme, in cooperation with the Thua Thien Hue Saola NR, is a new approach in biodiversity conservation aimed at reducing direct threats. Since Saola and Muntjac have been rediscovered, we have conducted patrols more frequently. Especially during the Tet Holiday period, we have enhanced patrols with 22 days per month (instead of 16 days per month as usual). Multi-Agencies patrols are also strengthened and focus on hunting and logging hotspot areas. We also developed a community awareness raising strategy because they are a very important part of our conservation work. We have been patrolling in the forest for at least 16 days per month under very difficult conditions, but we never think of this as a challenge. We always try to work very hard and adapt to the difficult conditions because we know that these animals rely on us for their survival. The biggest challenge of our work is dealing with local people. Hunting and setting traps is a long tradition and a livelihood of local people. Since the area became a protected area, we have been working with them to raise awareness, update them on regulations and fines on protected area violations. We also provided alternative livelihoods such as recruiting local people to our forest guard team. What is the biggest thing which makes you feel proud when doing your job? We removed nearly 25,000 snares since the start of CarBi Programme, which means 25,000 fewer opportunities for the killing of our precious wild animals. That is the greatest thing that we have done during the last three years. We believe that our efforts are contributing towards creating a safe environment for our rare animal numbers to increase, and for these important inhabitants of our beautiful forests to return to areas where they previously occurred. We are looking forward to seeing many more Saolas. Last year, in September, to acknowledge the effective efforts to protect the Saola Nature Reserve during the past 3 years, Thua Thien-Hue People’s Committee decided to extend the NR by another 3 500ha. We are very proud as we were part of the efforts, and its great to see that our work have paid off. Your messages to audience during Tet holiday? Let’s stop hunting, trapping, eating and buying wildlife meat. It does not only break the law, but also damage our beautiful country which should also be enjoyed by generations to come. Our efforts are never enough without you being part of the solution. We need strong support from all of you.